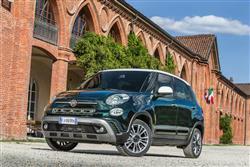 Find out everything you need to know on the new Fiat 500l from independent vehicle review website Car And Driving. You can watch the video review to the left to see more of the car or read their written review below to get a true insight from an expert in the automotive industry. A rugged Fiat 500? Has the world gone mad? Fiat doesn't think so and believes the 500L Cross more than justifies its existence. Jonathan Crouch reports. The chunky Fiat 500L is a larger and very different proposition to the hugely successful 500 city car it was spun from. Some felt though, that it could do with a bit more attitude. Such a thing is served up by the more rugged-looking Cross version, a variant aiming to help this model begin to forge its own identity. Some industry observers have it in for retro-styled cars. They see it as a lazy way of raiding the company heirlooms in order to make a quick buck. That's anything but the case though. Fiat will attest to the fact that when reviving a famous name form the past, there's a whole host of potential minefields to tiptoe through. Its 500 city car is one of the very best retro revivals, offering a modern take on a familiar shape while blending exactly the right combination of old and new design features. It's an object lesson in how to do retro right. Sometimes it doesn't go quite so swimmingly. In a bid to emulate what MINI had done in creating a family of cars spun off a familiar theme, Fiat created the 500L, a bigger and more spacious 500. That characteristic domed roof look was lost and the 500L looked like a generic mini-MPV that had had some Fiat 500 design cues grafted onto it. Of course, Fiat fans will point to the old 600 Multipla for provenance but that fact was lost on most buyers. As a result, sales have been slow to pick up. Beneath the hype though lies a very decent car and in beefed-up Cross form, is a more self-confident take on the 500L theme. The Cross gets the same engine choice as the rest of the 500L range, which means a 95bhp 1.4-litre petrol opening proceedings. Diesel customers are catered for with a very good 1.3-litre Multijet with 95bhp. This will make 62mph from standstill in 11.3 seconds with a decent slug of torque on offer. Then there are also two 120bhp powerplants, a 1.6-litre Multijet II turbo-diesel and a 1.4 T-Jet petrol. So it's just a front-wheel drive car with some plastic slathered down the side, right? Not quite. The key feature of the Cross is its 'Mode Selector', which gives the driver a choice of 'Normal', 'Traction+' and 'Gravity Control' settings. The 'Traction +' option improves traction over harsh and slippery terrain and costs far less than conventional 4x4 systems. This system uses the ESC stability control electronics to simulate the behaviour of a self-locking electro-mechanical differential. The system is activated using a button on the dashboard and can be operated at speeds of up to 19mph. Under conditions of low or zero grip from any driven wheel, the control unit detects slip and commands the hydraulic circuit to apply braking force to the slipping wheel, thus shifting drive to the wheel on the surface offering better grip. This ensures the best possible traction even over the roughest surfaces with poor grip. The 'Gravity Control' setting keeps the speed constant when descending steep slopes and can be enabled when the 'Traction+' function is active. You'll be amazed what a front-wheel drive can do. An additional 25mm of ground clearance also helps when taking the car along unmetalled tracks. The 500L Cross aims to project a more dynamic image than more suburban variants in the range and as such, gets model-specific front and rear bumpers, plus two-colour diamond-finish 17-inch alloy wheels and a bolder grille to give it a sporty appearance. The raised suspension offers a marginally more commanding driving position. The interior features a 'Uconnect HD Live' 7-inch centre-dash touchscreen. As with the standard 500L, there's a respectable amount of space inside, especially if you find you've grown out of the minuscule standard 500. The big benefit indoors is a sliding rear seat system. Slide the seats forward and there's still a reasonable amount of leg room and three can sit on the rear bench in acceptable comfort as long as they're not of linebacker dimensions. The 455-litre square boot features side cubbies, a three-position floor and pop-out bag holders. The rear seats can tumble forwards, while if you need to take really long loads you'll find the front passenger seat back can also fold flat. Fiat claims there are no fewer than 22 different storage spaces dotted about the car. The Cross trim level demands a £2,000 premium over base 'Pop Star' spec in the 500L model line-up. That means pricing that starts at just over £18,000 and ranges up to around £21,500, depending on the engine you want. Equipment with this variant includes 17-inch alloy wheels, a 'Cargo Magic Space' height-adjustable load platform, rear parking sensors and a 7-inch 'Uconnect' HD Touchscreen infotainment system. There's also dual zone climate control, a 'Techno-Leather' multi-function steering wheel, cruise control, front foglamps and auto headlamps and wipers. Plus the driving mode selection system and a bodykit. But of course that's just the start. Has any five-seater compact family five-door ever offered more scope for buyer personalisation than this one? We doubt it. There are decal packs to suit every taste and a wider range of paint colours than any compact car has ever offered. Whichever shade you choose, you can contrast it with a different finish for the wheels, the door mirrors - oh and the roof too. Inside, there's a body coloured-painted dashboard offered in five different shades or with beautiful suede trim. You can also specify a two-tone steering wheel and there's a choice of red or grey seat inserts. Fiat promises buyers a choice of over 100 unique accessories in a list that goes far beyond the usual bodykit, stereo and towbar choices. So your 500L might come with a bespoke PC bag, a steel clothes hook, an iPod holder or even a key in your own personal colour. It could even have a coffee maker. Yes really. The 500L Cross model's good value upfront prices are matched by some very competitive economy and emissions figures. With the 1.3-Multijet diesel engine and a little moderation, you might get within sniffing distance of the official 67.3mpg figure. Its emissions are rated at 108g/km. Buyers also get the choice of a Dualogic transmission on this model which not only takes the strain from your left leg but also reduces emissions to just 106g/km and increases fuel economy to 70.6mpg. If funds are a little tighter, the entry-level 1.4 petrol units gets 45.6mpg and emits 144g/km. For the 1.4 petrol T-Jet, the figures are 42,.2mpg and 157g/km, while for the top 1.6 Multijet diesel, you're looking at 65.7mpg and 114g/km. What else? Well, there's a Smart Fuel System that does away with a fuel cap and makes it impossible to put petrol into a diesel model - or vica versa. And servicing? Well that will be needed on petrol units every 18,000 miles, but you can stretch that to 21,000 miles if you opt for one of the diesels. The Fiat 500L Cross is an unexpectedly appealing thing. I'll freely admit that I've never been a fan of the way the original 500L was styled, but your opinion there may well vary. The Cross model distances itself further from the original 500 citycar and as such seems to justify its inclusion in the Fiat range a little more confidently. The mark-up of £2,000 over the standard 500L doesn't seem at all unreasonable given the extra equipment, not least of which is that clever driving modes system. Otherwise you get all the added practicality benefits of the 500L, which means loads of internal storage, a decent 455-litre boot and a sliding rear bench seat so that you can decide whether you want to prioritise rear seat space or luggage room or a compromise between the two. The 500L didn't get off to the easiest start to life, but the Cross version would seem to suggest that this model is just hitting its stride.